Co-Principal Investigator for the Environmental Design Space sponsored by the Federal Aviation Administration (FAA). Dr. Kirby is responsible for the development and application of EDS to support the Committee on Aviation Environmental Protection (CAEP) of the International Civil Aviation Organization (ICAO). Existing aircraft noise and aviation emissions analytical tools used by CAEP cannot effectively assess interdependencies between noise and emissions, or analyze the cost-benefit of proposed actions. Accordingly, the FAA’s Office of Environment and Energy (FAA-AEE) is developing a comprehensive suite of software tools that will allow for thorough assessment of the environmental effects of aviation. The main goal of the effort is to develop a new capability to assess the interdependencies between aviation-related noise and emissions effects, and to provide comprehensive cost and benefit analyses of aviation environmental policy options. The building block of this suite of software tools that provides an integrated analysis of noise and emissions at the aircraft level is the Environmental Design Space (EDS) for which Dr. Kirby is also the program manager and is responsible for directing the technical research of 15 graduate research assistants and three Research Engineers. Program Manager the multiple contracts for NASA’s Ultra-Efficient Engine Technology (UEET) Program Metrics Assessment Implementation. Dr. Kirby was responsible for developing the Technology Metrics Assessment and Tracking (TMAT) process that supported the annual UEET portfolio assessments. The TMAT process required Dr. Kirby to elicit technical information from the NASA technology experts and translate the technology into measurable and quantifiable attributes within a modeling and simulation environment, which was a collection of NASA analysis tools. Program Manager for the TMAT application to NASA’s Vehicle Systems Program: Dr. Kirby directed all technology portfolio assessments supporting this effort and collaborated with another Research Engineer for propulsion systems modeling. 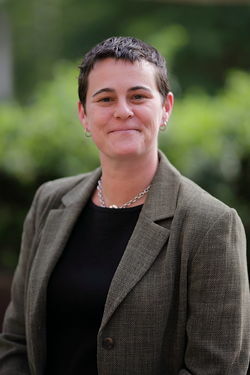 Program Manager for the application of the Strategic Prioritization and Planning (SP2) process which was applied to support the technology portfolio development for the office of Naval Research, NASA’s Vehicle Systems Program, and a Congressional study for an integration plan for NASA Aircraft Research Program. Program Manager for the Metrics for an Aviation CO2 Standard research project funded under the FAA's PARTNER Center of Excellence. In this effort, she lead the research team that supported the development of a aircraft level CO2 regulatory standard, which was adopted by CAEP member states in 2016. 2004 Arch T. Colwell Merit Award. SAE award presented to recognize authors for outstanding papers presented at SAE meetings. "Technology Portfolio Assessments Using a Multi-Objective Genetic Algorithm." 2005 NASA Turning Goals into Reality for the valuable contributions to the Ultra-Efficient Engine Technology (UEET) Project Component Demonstrations Team and exceptional progress towards the Protect the Environment Goal, October 2005. 2012 FAA Center of Excellence Faculty of the Year for her research contributions on metrics to support a potential CO2 standard for future aircraft certification, which was recently adopted at the CAEP/10 meeting in Feb 2016. Senior Member, American Institute of Aeronautics and Astronautics, 1994 – present. Member, Joint Planning and Development Office Environmental Working Group Technology Standing committee, 2008 – 2011. Obtained by election. Member, Committee on Aviation Environmental Protection Working Group 3 (Emissions), 2007 - 2016. Nominated by the CAEP U.S. member. Kirby, M.R., Mavris, D.N., “The Environmental Design Space,” 26th Congress of International Council of the Aeronautical Sciences (ICAS) , Anchorage, Alaska, Sep. 14-19, 2008, ICAS 2008-4.7.3. Barros, P.A., Kirby, M.R., Mavris, D.N., “An Approach for Verification and Validation of the Environmental Design Space,” 26th Congress of International Council of the Aeronautical Sciences (ICAS), Anchorage, Alaska, Sep. 14-19, 2008, (AIAA-2008-8875) ICAS 2008-P8.4. Raczynski, C.M., Kirby, M.R., Mavris, D.N., “Technology Portfolio Assessments Using a Multi-Objective Genetic Algorithm”, SAE 2004 Transactions, Journal of Aerospace, vol. 113, Section I, 2004-01-3144, pp. 1741-1747. Schutte, J.S., Kirby, M.R., Mavris, D.N., “Technology Assessment of a Supersonic Business Jet,”, SAE 2005 Transactions, Journal of Aerospace, vol. 114, Section I, 2005-01-3393, pp. 1316-1326. Kirby, M.R., Lim, D., Nam, T., Burdette, G.A., Boling, B., "Investigation of Notional CO2 Standard Applicability to Fleet-wide Fuel Efficiency", AIAA 2013-4411. Bernardo, J.E., Kirby, M.R., Mavris, D.N., "Development of a Rapid Fleet-Level Noise Computation Model", Journal of Aircraft, 2015, Vol.52: 721-733, 10.2514/1.C032503. Levine, M.J., Bernardo, J.E., Kirby, M.R., Mavris, D.N., "Average Generic Vehicle Method for Fleet-Level Analysis of Noise and Emission Tradeoffs", Journal of Aircraft, 2018, Vol.55: 929-946, 10.2514/1.C034368.